I’ve always had a curiosity about the world – thanks to my parents, my family and my friends. As a young child growing up in small town Canada, I was surrounded by families who were from all parts of the globe and across the country. I was told about the beauty of Italy and France, and regaled with photos of Australia. I remember seeing tea and candies being brought from England and Ireland and silk, copper and spices displayed after returning from India. But I also remember my parents subscribed to magazines – Reader’s Digest, National Geographic and Travel & Leisure. In our basement, the coffee table was the repository for all those magazines, as well as many books and atlases. I would spend hours in that basement room, playing, reading, watching tv and looking through those magazines, impressed by the pretty photos. 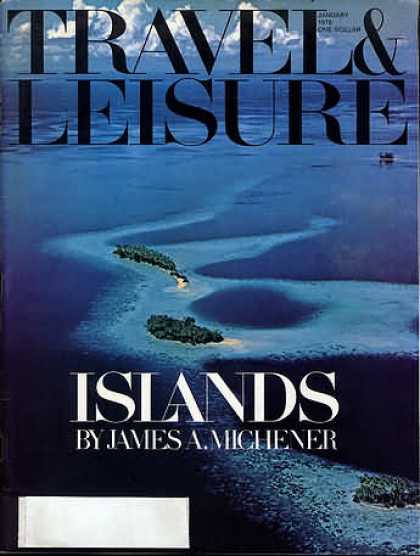 I was always enamored of islands, and I remember this cover from 1978 of Travel & Leisure. I didn’t know at that time who James Michener was, or why the cover was eerily similar to the same design used for his books. All I knew, I wanted to go there. I wanted to explore, build sandcastles and swim in the surrounding sea. It became one of my favourite images and an inspiration for my travels. Islands have always been a favourite and I’m woefully behind in my knowledge of how many I’ve visited. I know I’ll continue my island obsession and I can still picture myself, flipping the pages and looking at the images. Oh how I wish I remembered the words. « How to plan a trip? Isn’t it all about friends?